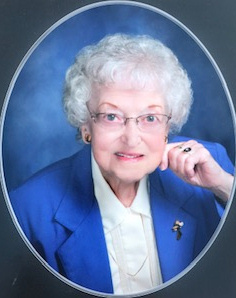 Mrs. Dorothy M. Carruthers, 94, passed away on Monday, April 1, 2019. A longtime resident of Massillon, she was born in Cameron, Oklahoma, on March 5, 1925, the daughter of the late Sam W. and Lorena (Nabors) Kinnerson. Having begun her career as a telephone switchboard operator for Southwestern Bell in Ft. Smith, Arkansas, Mrs. Carruthers transferred to Ohio Bell in Canton in 1947. She was later employed as a switchboard operator at Massillon Community Hospital. A member of First Baptist Church of Massillon for more than 50 years, Dorothy was active in missionary circle activities and the Senior Saints Choir. She also held membership in the Ladies Auxiliary of the Brotherhood of Railway Carmen in Brewster. Mrs. Carruthers was predeceased by both her first husband, Donald P. Myer, and her second husband, Rex V. Carruthers; her son, Gregory A. Myer; her brothers, James Hal and O.D. “Buddy” Kinnerson and her sister, Evelyn Kinnerson Thrift. She is survived by her daughter, Nancy Myer (Wayne) McElveen of Greensboro, North Carolina; granddaughters, Jennifer McElveen (Lee) Boan, of Lugoff, South Carolina and Julie McElveen (Lance) McPeak of Chapel Hill, North Carolina; one great-granddaughter, Macie McPeak; sisters-in-law Mrs. Bonnie Kinnerson and Mrs. Ocie Fay Kinnerson, both of Massillon and numerous nieces and nephews. Also surviving is a host of dear friends from the Brewster Parke community. Visitation will be held on Thursday, April 4, 2019, from 11:00 a.m. to 12:30 p.m. at Atkinson Feucht Hare Funeral Home in Massillon. A brief funeral service conducted by Dr. Roger Alber, pastor of First Baptist Church, will begin at 12:30 p.m. in the funeral home, followed by a private burial at Sunset Hills Burial Park. Gifts in memory of Mrs. Carruthers may be made to First Baptist Church of Massillon, 20 Sixth St. SE, Massillon, OH 44646; or to the charity of one’s choice.